What Type of Microphone Is Best For Recording Vocals? What Mic Should I Buy For Singing? What Kind of Microphone Do I Need? Every time you turn on the radio you know all the words. You’ll use the nearest hairbrush, cellphone, or pen as your microphone to sing into. How do Katy Perry, Justin Bieber or any of those people on the Voice sound so good? Have you ever wondered what you could really sound like? 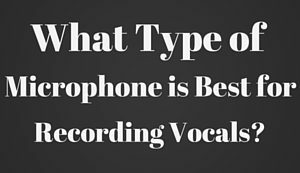 So the big question to be answered is: What type of microphone is best for recording vocals? We think it’s best to start with what a microphone is and a quick explanation of what each type is. Don’t let your eyes get crossed with a bit of ‘tech-talk’ here as you begin your journey to finding what mic would be perfect for you, you’ll hear the same terms mentioned over and over. It’ll all start to make sense. Promise! The microphone is a kind of transducer that converts sound energy into electrical energy. It is like a loudspeaker that works in reverse because a loudspeaker converts electrical energy into sound energy. Think of a microphone as a generator which generates electricity whenever it is struck by sound waves. 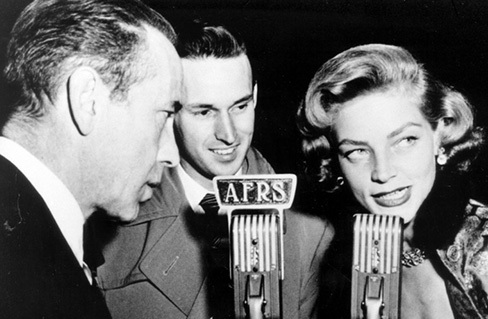 We always see microphones being used by reporters, singers, tv hosts and film makers. They have varying shapes and sizes depending on what you intend to use it for. Some microphones are very small like the condenser mic. Some microphones are very large as in the case of parabolic microphones which can detect sound waves from long distances. 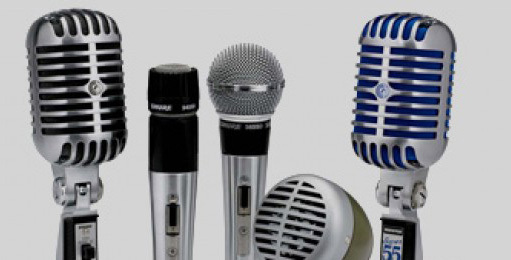 Microphones are also constructed from different materials and they also operate on different mechanisms. Bet you didn’t know there could be so many variables and options to figuring out what the best microphone for singing would be. Condenser – Condenser mics are also known as Capacitor Microphones. These microphones operate on the principle that when you apply a fixed charge on a capacitor, and you change the capacitance, the voltage across its plate varies. The condenser microphone is made up of two plates separated by an insulator. The capacitance of the microphone varies as the plates move due to sound waves. The first condenser microphones use a small battery pack to supply a fixed charge on the capacitor. Today, condenser mics use “electret”, a material that has fixed charge built in it and does not require an external battery. A perfect example of this type of mic would be the Audio Technica AT2035. Piezoelectric – Are used in situations that can be sonically challenging. 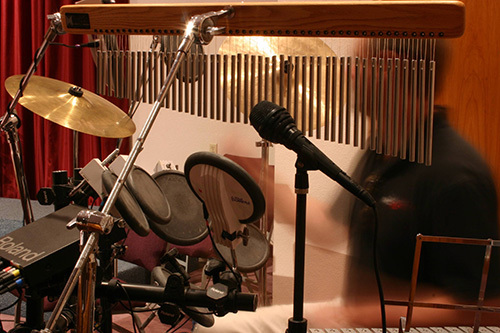 Drum hits and acoustic instruments are just 2 of the uses they are perfect for. Certain crystals such as quartz and rochelle salt generates a small voltage whenever they are compressed or tensed. Sound waves can also compress or tense these crystals and thus they generate a small voltage on the crystal faces. Dynamic – The dynamic microphone or electrodynamic microphone uses a fixed magnet and a moving coil that moves in response to sound waves. To increase the chances of capturing sound waves propagating to the microphone, the moving coil is attached to a diaphragm. The movement of the coil in a magnetic field generates a small voltage on the end terminal of the coil. Check out the Shure SM58 for a top of the line dynamic mic. Ribbon – These are similar in operation to the electro dynamic microphone. The only difference is that ribbon type microphones use a strip of metal shaped like a corrugated ribbon instead of a coil. Ribbon type microphones have lower voltage output than electro dynamic microphones but ribbon type mics impart a warm mellow sound to the voice of the user. These are the “classic” type microphones you see in old movies. Carbon – This microphone uses carbon granules packed in a capsule and was the first microphone to be used on telephone sets. The resistance of carbon granules varies with the sound wave that strikes the microphone capsule. Like the original capacitor microphone, this microphone needs an auxiliary battery to operate. Carbon mics can be used as amplifiers as well as microphones. Recording – These are optimized for recording music and voice. Cordless/Wireless- Headworn microphones for singers have come a long way in a few short years. It has a built in FM transmitter coupled with an amplifier. Directional – They can only “hear” sounds in a certain direction that you control. USB – These mics can be interfaced directly into a USB port. Plug-n-Play all the way! Stereo – Two microphones are packed in as one unit. The are attached to a ‘dummy head’ and they simulate the stereo of human hearing. Computer – Low cost mics that are connected to the microphone input of a sound card. So What Kind Of Microphone Do I need to Record Vocals? Even after that exhaustive breakdown there is still no simple answer. Are you looking to perform on stage? 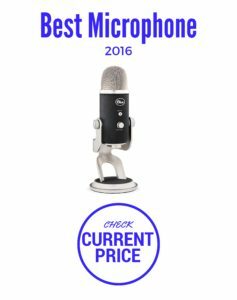 Then we would suggest checking out our picks for the best microphones for singing live. If you’re going to be in a quiet and controlled space, where you won’t be moving around, then we highly suggest you take a look at our microphones for singing at home selections. Each one goes into more specific depth based upon how you want to record. Many a great performance has been captured by the strangest of mic selections. You never know exactly when inspiration is going to strike. But with the right mic you will be ready when it does.